Excitons in cuprous oxide appear in the absorption spectrum as a hydrogen-like series with modified masses due to the different effective electron and hole masses of carriers in solids as well as due to the larger dielectric permittivity. Hence, binding energies of almost 100 meV are common. As the exciton Bohr radius scales as the principal quantum number n², expected Bohr radii for n=25 are in the µm-range, which is enormous for a single quantum object. Starting from such a system, one can now demonstrate schemes that harness light-exciton interaction of these giant Rydberg excitons, study Rydberg-Rydberg interactions, and, as cuprous oxide is a semiconductor, integrate it in a solid-state system. The aim of this project is to implement integrated and scalable solid state quantum devices based on the interaction of Rydberg atoms in cuprous oxide. In a first step, we want to establish schemes to quantitatively determine and modify the Rydberg exciton interaction by using spatially resolved pump-probe scheme, applying electric fields on electrode grids on the crystal, and by applying magnetic fields. In a second step, we want to investigate whether coupling to single excitons is possible. Therefore, we use high-quality fiber cavities to couple Rydberg excitons to cavity modes. 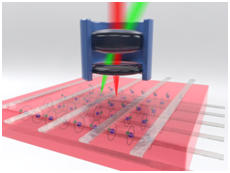 We furthermore use samples with high-quality printed microlenses and an angle-resolved scanner scheme as well as their combination with fibers with multiple single-mode cores to address different spatially neighboring Rydberg excitons. This way, we establish an integrated and scalable system to let two or more neighboring Rydberg excitons interact.